The 2015 Thomas County Central Lady Yellow Jackets softball team. Thomas County Central won three out of five games in a weekend tournament held Friday and Saturday. The tournament was sponsored by the Georgia Dugout Club and games were played at a variety of locations in North Georgia. TCC beat Starr’s Mill 10-9 on Saturday evening. 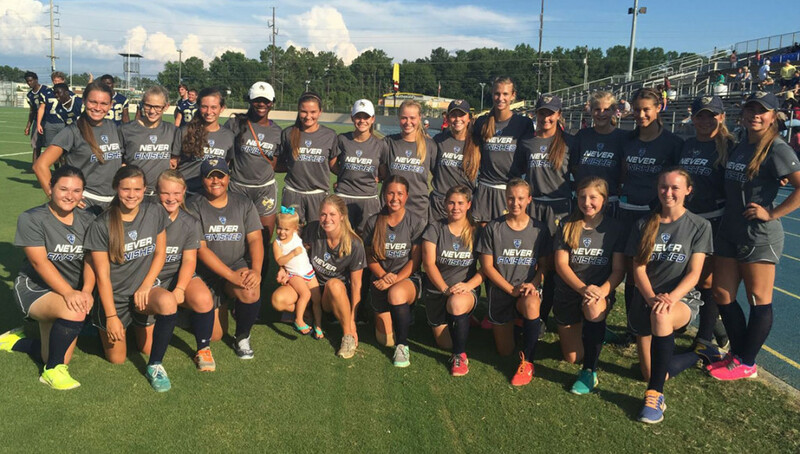 Earlier on Saturday, the Lady Yellow Jackets defeated Harris County 7-2 and beat Northgate 8-3. Saturday’s games were played at East Coweta High School in Newnan, Ga.
On Friday night, the Lady Yellow Jackets lost to Carrollton 10-1. TCC was edged by Pierce County, 9-5. Friday’s games were played at Carrollton High School in Carrollton, Ga.
Thomas County Central Lady Jackets Varsity and Starrs Mill lit up the scoreboard on Saturday as they combined for 19 runs. In the end, Thomas County Central Lady Jackets Varsity won the offensive battle 10-9 in five innings. The teams banged out 23 hits hits between them, as well as five for extra bases. The teams traded runs for most of the contest, leading to nine lead changes in the game. Thomas County Central Lady Jackets Varsity took the lead in the fifth inning and held on for the victory. Thomas County Central Lady Jackets Varsity went up for good on an RBI single by Parker Madeline off Brady, plating Kenlie Harvey. The bottom of the first saw Thomas County Central Lady Jackets Varsity take an early lead, 3-0. A two-run home run by Harvey, scoring Larran Carter started the inning off. Thomas County Central Lady Jackets Varsity then tacked on more runs when Madeline scored on an RBI single by Katelyn Hobbs. Starrs Mill matched its three-run third inning with three more in the fifth. In the third, Starrs Mill scored on a two-run home run by Ashmore, plating Sellers. It didn’t take long for Thomas County Central Lady Jackets Varsity to answer as it scored three runs of its own in the third. Thomas County Central Lady Jackets Varsity scored on a walk by Hannah Johnson, an RBI single by Emily Greek, and a hit by pitch. Thomas County Central Lady Jackets Varsity never surrendered the lead after the fifth inning. The runs piled on thanks to three singles. Katelyn Hobbs went 3-3 at the plate, sparking Thomas County Central Lady Jackets Varsity to a 7-2 victory in six innings over Harris County on Saturday at East Coweta High School. She doubled in the third inning and singled in the fifth and sixth innings. Harris County’s lineup had no answer for Larran Carter. Harris County managed just two hits off of the Thomas County Central Lady Jackets Varsity’s pitcher, who allowed no earned runs, walked one and struck out none during her 4 1/3 innings of work. Thomas County Central Lady Jackets Varsity jumped out to an early 1-0 lead in the top of the first. After a quick strike from Thomas County Central Lady Jackets Varsity, Harris County responded with one run in the first. Harris County scored on. Thomas County Central Lady Jackets Varsity didn’t relinquish the lead after scoring four runs in the third inning when it scored on an RBI double by Hobbs and a three-run triple by Carter. A one-run fourth inning helped bring Harris County within three. A steal of home by #21 sparked Harris County’s rally. #16 to end the Harris County threat. Thomas County Central Lady Jackets Varsity brought home one run in the fifth inning, and matched that run total in the sixth. In the fifth, Thomas County Central Lady Jackets Varsity scored on an error, bringing home Hobbs. Thomas County Central Lady Jackets Varsity beat Northgate 8-3 in five innings on Saturday at East Coweta High School behind Kenlie Harvey, who went 2-2. She doubled in the first inning and singled in the second inning. In the top of the first, Northgate grabbed the early lead, 1-0. Render started the rally for Northgate with a single. A stolen base then moved Render from first to second. Ingleston singled, plating Render. Thomas County Central Lady Jackets Varsity survived Northgate’s surge and put up one run of its own in the first. Thomas County Central Lady Jackets Varsity scored on an RBI single by Payton Burton. The game was never in doubt after the second, as Thomas County Central Lady Jackets Varsity scored four runs on four singles. One run in the top of the fourth helped Northgate close its deficit to 6-2. An error sparked Northgate’s rally. Finally, Larran Carter got Render to fly out to end the threat. Thomas County Central Lady Jackets Varsity answered Northgate’s top inning with two runs of its own in the fourth. Thomas County Central Lady Jackets Varsity scored on a two-run error. After pushing across one run in the top of the fifth, Northgate faced just a 8-3 deficit. An RBI double by Ingleston fueled Northgate’s comeback. Northgate’s Kinsch struck out to end the ballgame. Despite a big day at the dish from Anna Greek, who finished 2-3, Thomas County Central Lady Jackets Varsity lost 10-1 to Carrollton High School at Carrollton High School on Friday. Carrollton High School’s #24, #21, #1 and #17 combined for eight hits and eight RBIs. Carrollton High School didn’t relinquish the lead after scoring three runs in the first inning when it scored on a two-run double by #21 and an error. The fifth inning saw Thomas County Central Lady Jackets Varsity score its only run on the day on a fielder’s choice. #21’s three-run home run scored #5 and #24 and helped Carrollton High School score five runs in the sixth. Kenlie Harvey did all she could to give Thomas County Central Lady Jackets Varsity a boost, but it wasn’t enough to get past Pierce County, as Thomas County Central Lady Jackets Varsity lost 9-5 in seven innings at Carrollton High School on Friday. Harvey had two extra-base hits for Thomas County Central Lady Jackets Varsity. She homered in the first inning and doubled in the sixth inning. In the bottom of the first, Thomas County Central Lady Jackets Varsity grabbed the early lead, 1-0. A solo home run by Harvey started the inning off. Pierce County went up for good in the fourth, scoring one run on an RBI triple by Aldridge. Sikes’ blast scored Cox, Royer and Carter and helped Pierce County score seven runs in the fifth. Two runs in the bottom of the fifth helped Thomas County Central Lady Jackets Varsity close its deficit to 9-3. An RBI single by Parker Madeline and an RBI double by Katelyn Hobbs set off Thomas County Central Lady Jackets Varsity rally. Two runs in the bottom of the sixth helped Thomas County Central Lady Jackets Varsity close its deficit to 9-5. An RBI single by Payton Burton and an RBI single by Christina Ansley fueled Thomas County Central Lady Jackets Varsity’s comeback.